I was at a dinner party in Cheverly a month ago and was talking to the host about how he gets to work in College Park. His answer, “bike”. Bike? Yes, bike. And that made me think about the trails near the Bladensburg Waterfront Park that I’d seen but never been on. Some of my very favorite memories in life consist of things I did outdoors like biking in the mountains of Austria (which nothing can compare to, really) , roller blading (when I lived in Minneapolis one summer), and hmmm… that’s about it. I guess I’m not as outdoorsy as I’d like to think. Anyhow, this spring weather makes me want to spend as much time as possible outside. Last weekend the fam hit the Anacostia Trail System for the first time. Now I’m begging my husband to purchase bikes for all of us from Arrow Bikes in Hyattsville. J It was a blast. The kids were on their scooters and we were walk/running to catch up with them. What a happy morning. I’m going to walk away from this rabbit trail now. The Anacostia Trail System needs to be its own separate blog post. Onto the National Arboretum and their amazing events this weekend. If you haven’t been to see the azalea’s there, you need to ask yourself, “Why Not?!”. The Arboretum is our next door neighbor (essentially) and this weekend they have some great events. Last year I went to the Garden Fair and Plant sale. Loved it. And of course, the Azaleas are blooming. If you can’t make it on their tour, pack a picnic lunch and see them on your own. To live so close to the Arboretum is pretty amazing—and that is just another reason to choose Cheverly. 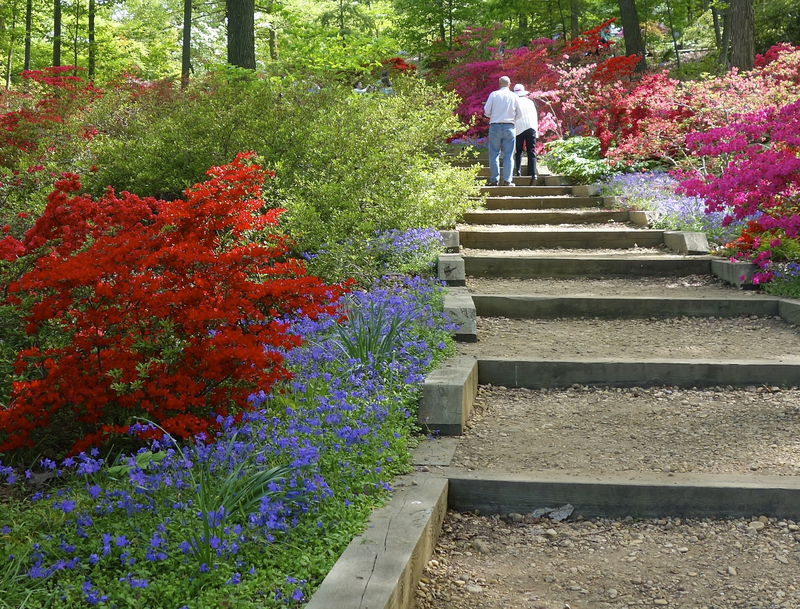 Stroll along wooded hillside trails amid a brilliant spring display of thousands of blooming azaleas while learning about the origins and culture of these popular shrubs. Barbara Bullock, long-time curator of the renowned Arboretum Azalea Collections, tells the story of how Arboretum research has contributed hundreds of new varieties for gardeners; gives expert advice on all aspects of growing azaleas; and answers your questions. See the progress of the Glenn Dale Hillside Renewal Project, a major renovation to improve conditions to increase the vigor and bloom production of thousands of azaleas. Fee: $12 ($10 FONA) Registration required. The annual Garden Fair & Plant Sale features new, rare, and hard-to-find plants, garden supply vendors, books, children’s activities, refreshments, entertainment, and more. Bring your garden questions to National Arboretum staff members for expert advice. Sponsored by the Friends of the National Arboretum (FONA). Call FONA at 202-544-8733 for more information. Free admission.